Freedom Rockz: Honor Our Troops! 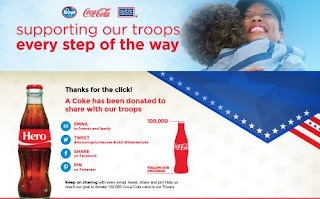 Send a Free Coke to Our Troops! Honor Our Troops! Send a Free Coke to Our Troops! Honoring our Heroes Donate a free Coke to our troops. Click on the link below then go click on the top "promotions" tab to get the share a Coke link - every click donates a Coke.